The expectation of the lovely sounds of pure silence while I cleaned the wreckage of homemade pancakes, eggs and turkey bacon was rudely interrupted with the screams of, “Dad! The TV won’t work again!” As a three-year customer of satellite TV, I was used to outages during rain or wind. More and more often lately, though, I spent a bunch of time resetting cable boxes as error messages filled the screen. As I scooted into the living room, I saw a message that my cable box was no longer compatible with the TV. I ignored the blue screen warnings and spent 20 minutes resetting the cable box four times to a chorus of grumbling with each reset. By the end of the fourth reset, the one complaining the loudest was me. I knew right then that was my last day as a cable subscriber. I decided to cut the cord – forever. My satellite TV bill was $135 a month without subscriptions to extra movie stations like HBO and Showtime. 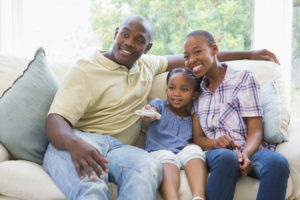 As a financial advisor, I often get caught up in not spending extra on frivolous items, especially when a subscription to Netflix and Amazon Prime should fill my family’s TV needs. However, during certain months of the year, I’ve added on a sports package that raised my monthly fees to about $200 a month. I always figure I won’t sign up for these, yet they auto renew to my account every year. Throughout the year, I was spending about $160 a month on cable TV for my family. I figured I must be able to do much better by going towards a streaming option. I was right, but how right surprised me. If you are like me, you could spend hours reading reviews, scanning through prices and trying to find the absolute best place for a streaming device for your house. After about an hour, I realized that, despite my relative technological prowess, this was too new to me and I couldn’t clearly discern exactly what was best for my household needs. I ended up doing what I think most people should do when facing a tech conundrum – go to your local Best Buy. This isn’t an advertisement for the company, but do not discount the fact that the employees wearing the blue collared shirts are trained to help you understand a variety of tech gadgets. They didn’t disappoint in this case either. We quickly arrived at the right model, type and piece I needed for my TV and I was out of the store with what I needed in under 10 minutes. I must mention that I always have confidence because Best Buy price matches any advertised price from a reasonably sized and known retailer. With a quick look online, I discovered a better price, so I walked out spending $39.99 for a streaming device which was price matched, saving me $10. Upon arriving home, the entire process of opening the box, plugging the dongle into the side of the flat screen and maneuvering through the setup menus had the kids watching TV in a matter of 15 minutes with no hassles. Doing my early morning research, I knew I now needed to sign up for a streaming service and settled on a monthly subscription of $40, which is offered by several quality name brand platforms (like Hulu, YouTube TV, etc.). Even my little, who just turned six two weeks ago, can navigate the streaming menus and work her way through selecting shows. One thing I found unexpectedly nice was that I went from hundreds of stations back to a far more manageable number. When was the last time you looked through the cable TV menu guide on your screen and used the down arrow to sift through all the stations? On a streaming service, you may find you have virtually all the ones you need without endless channel clutter. Then, as my clients would accurately predict, my financial nerdiness kicked into overdrive. I realized I was going to be saving, on average, $120 a month making this switch ($160 a month average to now $40 a month). So, I logged onto my monthly savings site on my existing Schwab account through our low cost HHWM Direct platform and set up an additional $120 a month to go into my account. I was already used to spending it on lousy cable TV services, so I may as well save it and earn interest. Plus, I know the trick of saving is using those cut dollars to go into an investment account for long-term growth. Cutting the cord and going to streaming puts an additional $57,414 in my pocket over the next 20 years, if invested properly and earning 6.25% over that time! More than $57,000 just by changing how we consume TV?! It’s incredible to think my $57,414 extra could have been in the hands of the satellite TV company if I hadn’t made the move into the 21st century! 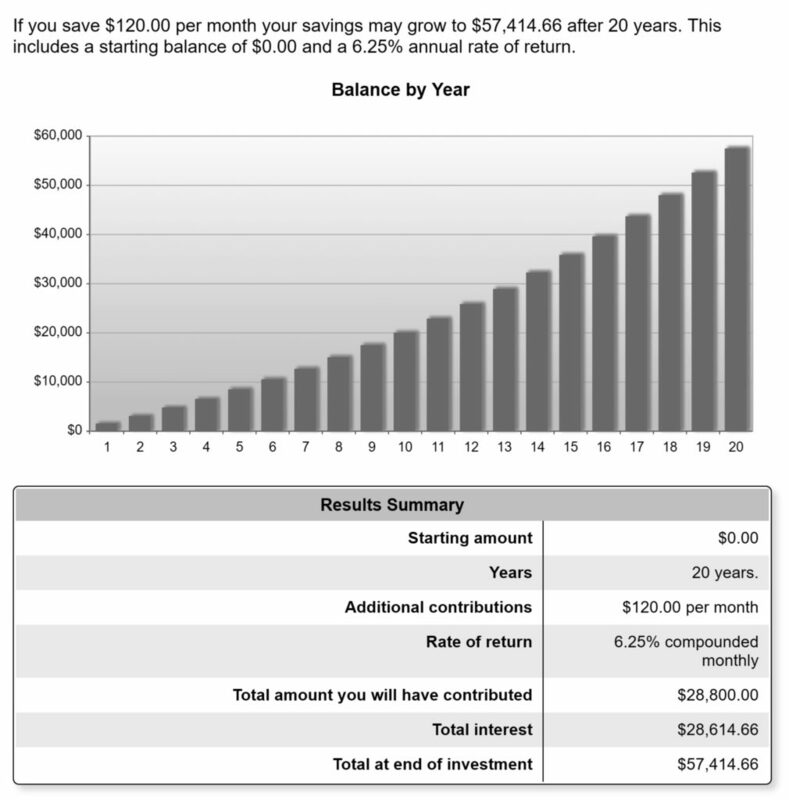 Schwab offers a nice, free tool to help with calculations like this one. The above table gives me several options. 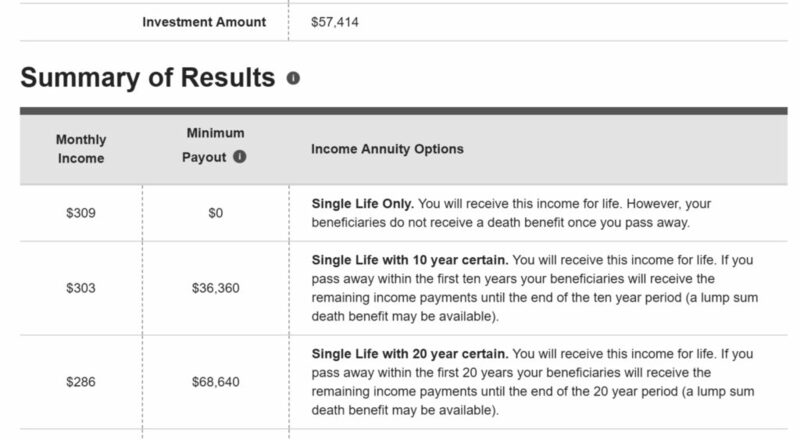 I would likely take option three – $286 of monthly income for 20 years certain. So, my $57,414 accumulation will provide me even more benefit in retirement with a $68,640 total benefit. I have found that streaming technology not only works well for watching TV – it can be done very inexpensively compared to traditional cable options. The value of saving you and your family $100 or more a month can be substantial, especially when combined with saving those dollars into an investment account and compounding your interest. If you have more time on your side to save and let your money grow, and you earn a great rate of return in a diversified low-cost portfolio, you too could end up making a massive difference to your own personal finances over time. After all, the best time to save is right now!